Proudly assembled* in the U.S. at Kia Motors Manufacturing Georgia (KMMG) in West Point, Georgia, the 2019 Optima will go on sale later this year and will be offered in four trim variants: LX, S, EX, and SX. Pricing will be announced closer to the 2019 Optima’s on-sale date. The 2019 Optima receives a number of redesigned interior and exterior elements. The LX comes standard with Stinger-inspired LED daytime running lights, a new 16-inch alloy wheel design and matte gray-finish grill. A long list of enhancements to the affordable S model emphasize sportiness and technology, including: new projection beam fog lamps, LED taillights, dual exhaust, sport side sills with gloss black trim, a gloss-black grill and 18-inch alloy wheels. Standard push-button start, smart key, smart trunk and power front windows with auto up/down functionality add convenience. The EX boasts the turbocharged 178-horsepower engine with a seven-speed dual clutch transmission with an adaptive Smart Shift drive mode. It also adds new leather seating surfaces with front seat heaters. A new 17-inch alloy wheel design and Smart Cruise Control with Stop-and-Go1 are standard. Similar to the S, the EX is equipped with standard fog lamps, LED taillights and dual exhaust. Available options include new ambient multicolor interior lighting, and a heated steering wheel. Redesigned 18-inch wheels are standard on the SX and the SX Limited (SXL) package is available with Michelin 235/45R-18 tires. New LED fog lights, ambient interior lighting, sport steering wheel and Smart Cruise Control with Stop-and-Go functionality are standard on both SX and SXL variants. The SX features available European-styled red and black two-tone sport leather-trimmed seats, panoramic roof, a Harman Kardon®3 premium audio system with UVO link with Navigation, heated steering wheel, gloss black door pillars and side moldings, and a sport bumper with LED fog lamps. The SXL is available with a striking new two-tone bronze and black interior with Nappa leather seating surfaces. Offered as standard equipment across the Optima lineup are a number of ADAS1 features, a suite of technologies designed to work in concert to potentially lessen the severity of a collision or avoid it entirely. Under certain driving conditions, Forward Collision-Avoidance Assist (FCA)1 can automatically apply the brakes to reduce speed, which may minimize the effects of a frontal collision. The Forward Collision Warning System (FCW)1 is designed to detect a potential collision with a vehicle it senses in front of the Optima and provides an audible warning and visual displays to alert the driver. Driver Attention Warning (DAW)4 monitors the driver and will provide visual and audible alerts if it senses the attention level has been significantly reduced. Lane Keep Assist (LKA)1 may apply corrective steering if it senses the vehicle drifting outside the intended lane, while the Lane Departure Warning (LDW)1 monitors the position of the Optima within its lane and warns the driver if it detects that the vehicle is deviating or about to deviate from the intended lane. Since its introduction in 2013, Kia’s UVO telematics and infotainment system has made it easier than ever for owners to interact with their Kia vehicles and also stay connected. 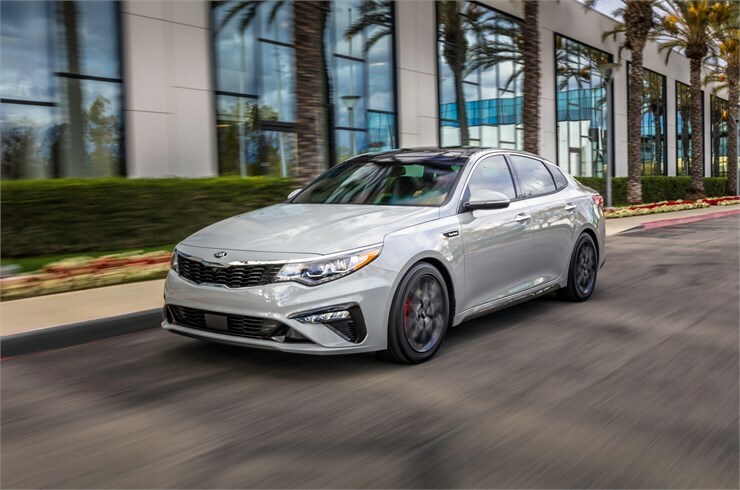 With ever-increasing functionality and in-vehicle entertainment options, KMA is restructuring UVO into an easy-to-understand tiered system and the 2019 Optima is the first Kia to launch with this approach. UVO play is standard on the LX. Featuring Apple CarPlay®5 and Android Auto™6 capability, UVO play tethers the user’s compatible smartphone to the Optima’s audio system through a USB cable7. Via voice recognition8, drivers may use their compatible Apple9 or Android10 smartphones for navigation, to make calls, send and receive messages, and listen to music all in a way that allows the driver to stay more focused on driving. UVO link11, available as standard equipment on S, and EX models, offers an extended suite of connected-car security and convenience features. UVO link includes Apple CarPlay5 and Android Auto6 support and adds features such as on-demand diagnostics12, maintenance alerts, vehicle alarm notifications, geo fencing and speed alerts. Similar to the K900 luxury sedan, convenience features such as remote start with HVAC control13, remote lock/unlocking, and remote activation of the horn and lights are all included in UVO link. The top-tier UVO link with Navigation is offered optionally on the EX with Premium Package and standard on the SX and SXL. Standard with all the features in UVO play and UVO link, UVO link with Navigation adds MY POIs and Map Care, which allows for two free map updates per year14.